Mother Earth is a canvas for the expression of beautiful works of art. 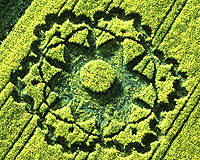 Over 100 crop circles appear globally each year. Although the origin and purpose of many are a mystery, just seeing them is an awe inspiring experience. This unique book was designed for children of all ages. The images draw us in, sparking our creativity and connecting our inner self.